I finally got around to fitting the lower fairing pieces back on. The cool, wet mornings was the main incentive to do something about it. The biggest obstacle was the simple decision on whether or not to modify the lower right fairing so the sidecar mounting points were accessible. There were some that thought that I shouldn't hack chunks out of the plastic fairing pieces as replacements may be difficult to find in case I wanted to put the bike back to stock. At this point, the sidecar is staying. To determine where I needed to cut, I removed the sidecar and set up a camera aimed at the right side of the motorcycle. I took one photo showing the front subframe. 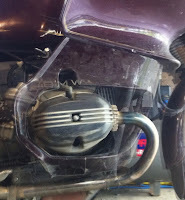 The front mounting points are the circular hole just below the fairing above the exhaust header and below the cylinder adjacent to the exhaust pipe. 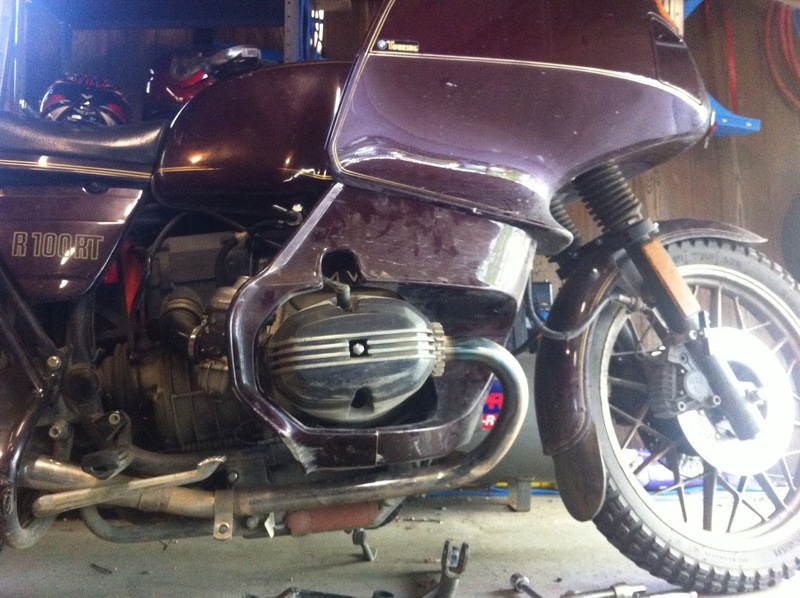 I removed the subframe and loosely mounted the lower fairing and took a second photo. I could've overlaid the two photos with one of them partly transparent but it was simpler to print them out and overlay them with a light source behind them. I then transfered the mounting points onto the second photo with a pen. Very old school. It was a simple matter to cover the lower with painters tape and transfer the mounting points onto the fairing. The upper opening was simply drilled with a hole saw, literally 30 seconds. The lower one proved to be more challenging as a lot of material needed to be removed. 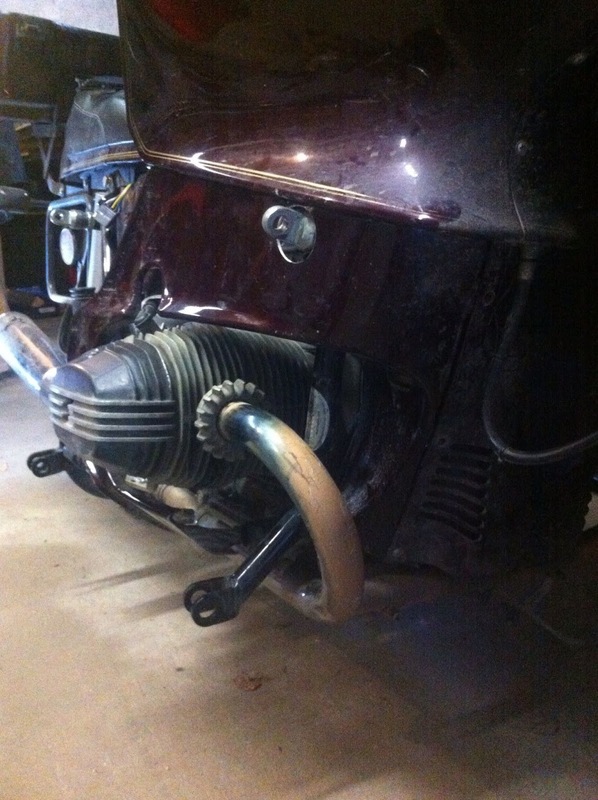 Plus the fairing actually almost touches the frame itself behind the exhaust header. I ended up drawing a line along the subframe and cut the plastic just in front of the line until I was just above the exhaust header. I have some touch up paint to cover the white plastic showing where the cuts were made but was amazed at how thin the plastic was. After putting the sidecar back on, a quick test ride in the rain demonstrated the utility of the lowers. Dry pants and boots. What a difference. These photos really show that I need to clean the bike...again. The rain just isn't cutting it. Very nice job with the cutting! I am afraid that I would have just eyeballed it, with resulting predictably terrible results. I suspect that the purists would still object but it came out alright. And it was basically done by eye. If I did it again, I would have cut long and gradually cut more material off to make a closer fit to the subframe. It only look about 5 minutes to remove the sidecar and about 10 minutes to put it back on. DMC has a great mounting system. None of the adjustment points were changed. Last winter, I left the left lower fairing in place and just removed the right. The left side was much warmer than the right. I still need to insure that there isn't a lot of vibration from the remaining pieces. I've been thinking of a reasonable way to do this for a while but didn't want to remove the sidecar. I thought that I would have to realign it again. Turns out to be a simple, straightforward process. Just four bolts and unplug the wiring harness remembering to put the side stand down first. Installation was the reverse. Very quick with my son helping. Glad it worked out for you and will add to the comfort come winter. This sidecar rig has become such a labor of love and sweat for you I think you'd be better off to leave it as is, if you want a 'stock' bike again, I suggest you purchase a second bike, then you could have one winter ready and one summer ready - all ready to go! It feels warmer already and even though it has been raining steadily for the last couple of days, arriving fairly dry is a nice plus. Of course, all of these trips are just around town. 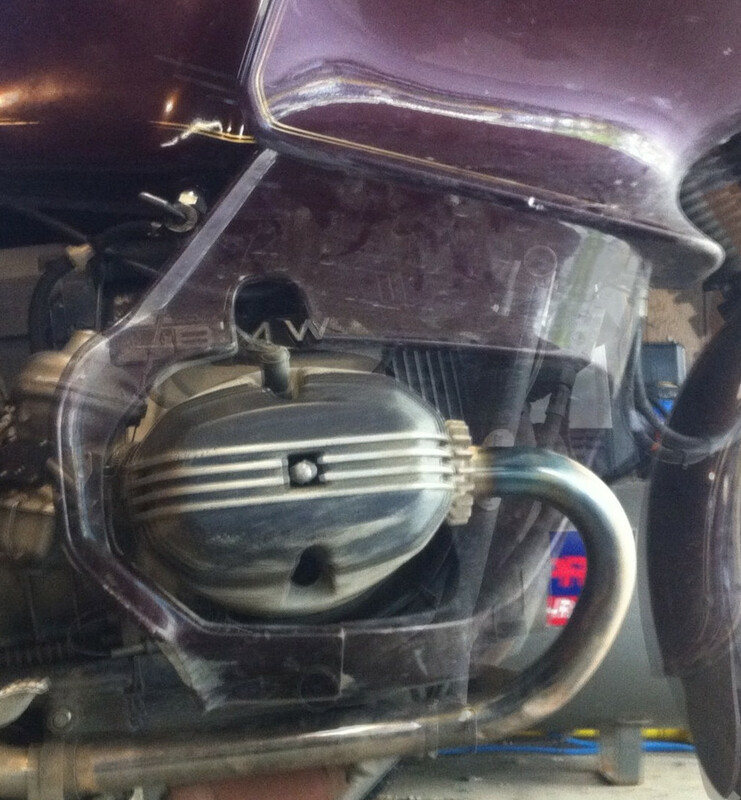 I think that the sidecar will be staying on this bike. I occasionally think about another bike but honestly, this one is enough. 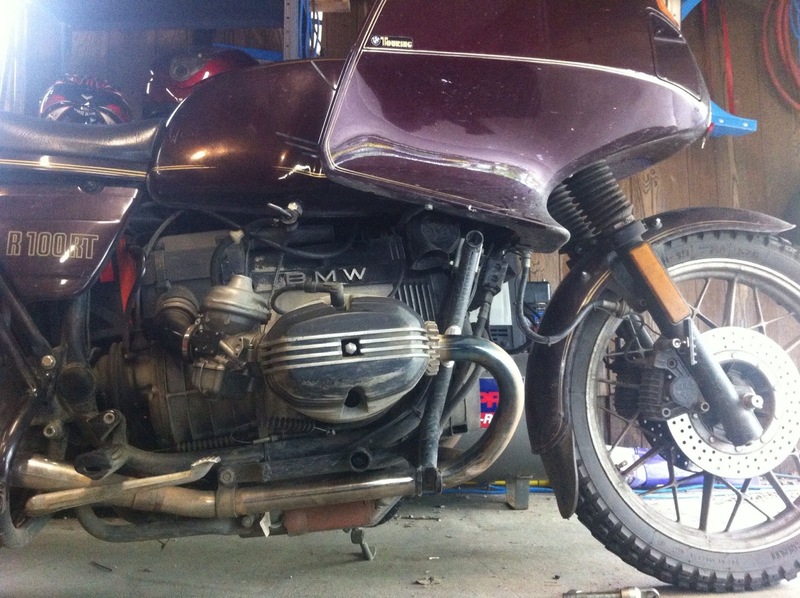 If I ever do look for another bike, I'd be torn between a 2WD Ural and one of the "F" series BMW GS models. RichardM, although I am proud to call you a fellow sidecarist....I'd be happier to call you a fellow Uralista....just saying. I will say though, I am glad I have my '87 R80 Airhead for the nice days of riding and for work commuting into downtown Denver. I think I need to keep plugging away with the Airhead. Yesterday, the low beam headlight turned off whenever I turned left and came back on when straight or right. As you'd guess, a broken wire in the harness. Took it apart and fixed it easy enough. I wonder how long it's been doing that? I think I'll be watching others experience with the new EFI system and see if it helps cold starting and economy without impacting reliability. I figure that the resale value of this bike isn't enough to be concerned about. It isn't collectible, replacement parts are readily available, including replacement plastic. Maybe I'll try and clean things up this weekend. I did clean off the lower before taping and cutting but after the last couple of rainy days, it looks just as dirty as the rest of the bike. Of course, discovering that they opened a gravel road which will shorten my commute by almost 10 feet didn't help. It has been a slow path involving a great deal of patience and perseverance to get the hack sorted but it is clear that if one wants to ride in a place like Alaska then a sidecar seems mandatory.Unless you want to ride only on days of perfect weather. Which of course I do so Alaska and hacks are only theoretical you understand. I wasn't in a real hurry to put the lowers on as it makes it feel much warmer while riding. After all, who wants to be warm while riding? I agree about the hack simplifies riding in Alaska. There are more than a few half-crazy riders who stud the tires on their KLR or DR to ride in the winter on two wheels.